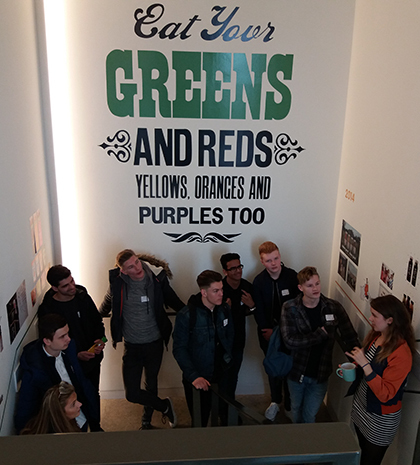 Business students at The Sixth Form College, Solihull enjoyed a trip to London to visit Fruit Towers, the UK headquarters of Innocent Smoothies, to see their unconventional business strategy. A range of BTEC, Year 1 and Year 2 Business students learned how Innocent have gone from a small start-up to Europe’s biggest smoothie brand, with revenues in excess of £250m. The students were fascinated to learn about the company’s unconventional business strategy and workplace. On a guided tour, they were told that Innocent give 10% of their profits to charity, whilst also helping other independent causes as they arise. For their employees, they give the opportunity to win a £1,000 contribution to tick something off their “bucket list” (a world tour and a cheese-making connoisseur course were awarded on the day the students visited!). In addition to this, for breakfast and lunch Innocent offer free food (and smoothies, of course), for relaxation, a ping pong and foosball table, and for team-building, an open and flexible working environment that rivals Google. While at Fruit Towers, the students were allowed to try “exclusive” new smoothie recipes, including one with kale, spinach and cucumber. While in London, the students also visited Portobello Road, nestled in the trendy London district of Notting Hill and home to one London’s (and the world’s) most iconic and famous markets. The students learned how many global brands started selling their wares in this market, and nowadays young entrepreneurs have the opportunity to sell their unique products to a multicultural market. Next up, students visited the Museum of Advertising and Brands. This included a Time Tunnel in which students could see the changes in advertising practices throughout the ages (and teachers could reminisce about toys and products from their youth!). The fieldtrip concluded in London’s business district with a visit to the Sky Garden, the UK’s highest garden at 150m high. Here, the students were treated to sweeping views of the capital whilst tourists and locals dined at the exclusive restaurant.